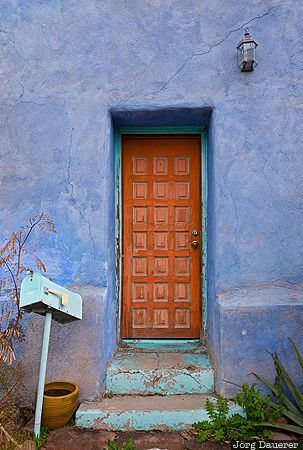 A blue facade with a wooden door and a tilted green mailbox in the Barrio Historico district of Tucson. Tucson is in southern Arizona, United States. This photo was taken at noon on a sunny day in January of 2015. This photo was taken with a digital camera.